I’m in this sweet spot right now where things are pretty darn great. And I am so grateful. I have my health, a wonderful family and a job I love. Sometimes I want to stop time or at the very least have a strong reminder of this moment in my life. I’ve never written letters to my future self, but I’m kind of digging the idea. Lea Redmond has created a book of twelve fold and ‘mail’ letters, Letters To My Future Self. Each note to your future self prompts some reflection–its like a dozen diary entries for later. I think its the perfect way to contemplate life in the moment. And what a great reminder down the road when things head south or when you want to remember that amazing vacation you took as newlyweds. Wouldn’t this make a gift for a graduate or someone embarking on a great journey in life? 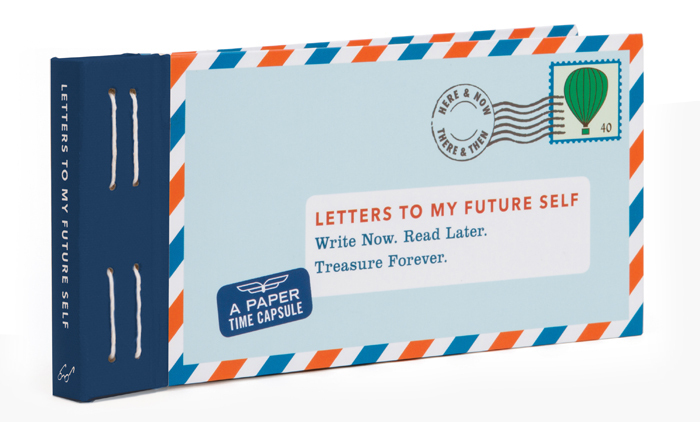 Have you ever written letters to your future self? Or your former self? Love this Lauren! What a terrific idea. I feel the same about being in sweet spot right now sort of coupled with wanting time to just slow down a little. What a great way to really honor these moments of life. I think I’ll pick a couple of these up. One for me, one for a friend. Thanks for sharing!